Rentals – Not only will you have a tent, you also need tables, chairs, linens, flatware, china, glassware, etc. And on top of those things, your caterer may also need convection ovens, heating racks, prep tables, trash cans and possibly a tent of their own for prep. 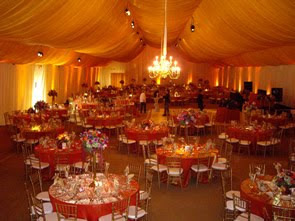 You may opt to have a floor in your tent, fabric draping, special lighting and a stage for the band. Portable Restrooms – Even if the home has a few restrooms, it is always good to have a back-up just in case there are plumbing issues. You can rent luxury trailer port-o-lets that come with sinks and mirrors. Parking – Most homes cannot accommodate 75+ vehicles. Arrange for shuttles, rent a nearby parking lot, provide valet services or ensure neighboring estates can accommodate overflow parking. Lighting and Power – Not only will you need lighting for your tent, you will also need lighting for the caterer, walkways, and restroom area. You can count on having a generator for the caterer, band and lighting. Be sure to check with those vendors for power requirements. A DJ may not require much but a large band will need a lot of dedicated power.